Get your daily dose of vitamin C in this classic 3 reel game. Click here to play! You'll be hoping to line up fruit across a single pay line in order to bring in a whole lotta green! In this exciting game, the ultimate treat is cherries. If you can spin three of these across the pay line you will get up to 400 coins. Next in line are lemons. Three of these will get you up to 120 coins. Three apples will get you up to 90 coins. 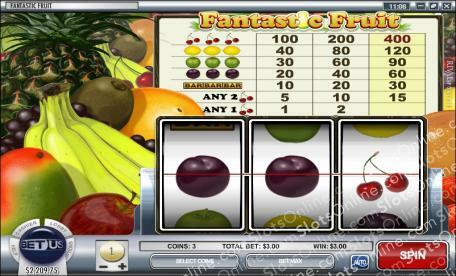 Plums are also a hot commodities in this game, bringing in up to 60 coins if you can get three across the pay line. You'll also be looking to spin single BARS across the pay line, as they will get you up to 30 coins. Any two or any one cherry symbol will also win, bringing in 15 or 3 coins respectively. It's essential that you bet the maximum of three coins in order to activate the highest pay table and bring in the biggest wins! Try your luck in this classic game. If you can bring in the fruit you'll be leaving with plenty of cash!